Clown shoes are an integral part of a clown’s costume. Traditionally they are supersized shoes, proportionally larger than the rest of the clown’s body. Simply slipping on a pair of oversized shoes will not work, as clowns must be agile and quick on their feet. They may look clumsy, but it is all part of the act. The last thing a clown needs is to actually trip over his own feet. It is fairly easy to make your own clown shoes. It will require two pairs of shoes. Purchase a large pair of shoes, ideally size 18. Converse's Chuck Taylor brand comes in a size 18. It may be necessary to special order the supersized shoe from your local shoe store or online. Purchase a pair of comfortable shoes in your size. These shoes will need to fit inside the larger pair of shoes. Apply glue on the insole of the right supersized shoe, and then quickly push the smaller right shoe inside and press down on the glue. Position the shoe before the glue dries. Repeat with the left shoe. Decorate the outside of the larger shoes with the colored markers. 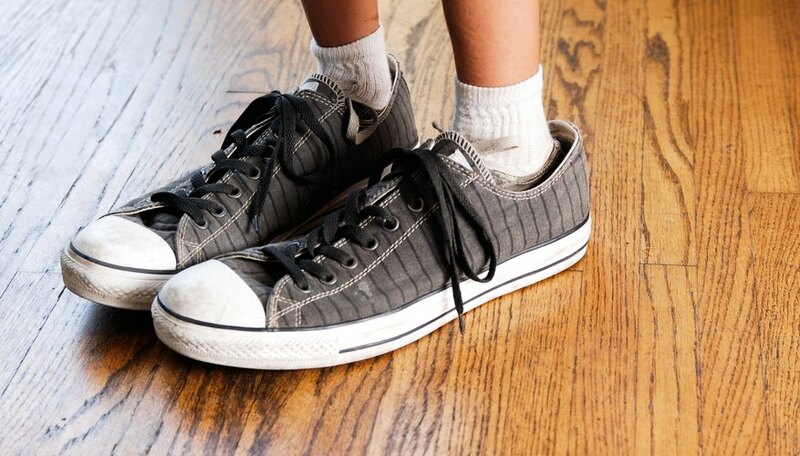 If you have very large feet, you may need to choose a larger shoe than size 18. Check out eBay for large used shoes. Before you buy make sure the smaller shoes will fit inside the larger pair.